I've generally made it my policy in the six years I have been doing this blog not to respond to anonymous comments. In fact, I usually delete such comments on the premise that if people are unwilling to publicly own what they say, what they say shouldn't be seen by the public. But I'm making an exception to that policy for this post. A comment appeared on the third installment of this series, one which, to some extent provides a natural segue to the rest of this series. But that isn't the only reason for my decision to not only leave the anonymous commenter's words on this site, but to address the opinions expressed there. Another big reason is that this commenter's words reflect such a misunderstanding of what I have been saying here, I can only conclude that I haven't been effectively communicating in the first three installments. In short, I have experienced no change of perspective on Jeremiah Wright's public pronouncements. My goal has been fairness throughout. More on that momentarily. “Do not judge, and you will not be judged; do not condemn, and you will not be condemned. Forgive, and you will be forgiven..."
It is absolutely wrong for Christians to apply standards to other Christians they would not apply to themselves. We know that all people are sinners who fall short of the glory of God. Christians believe that we are saved by God's grace and not because of moral superiority. So far as I know, I have not violated Jesus' directive against judging in my words about Pastor Wright's public communications. I have attempted to be fair and gracious, striving to do unto Pastor Wright what I would hope that he would do unto me. But we members of "the one holy, catholic, apostolic Church," the body of Christ, also are called upon to make judgments about what is right and wrong, what will advance and what will harm the witness of Christ and the Church each and every day. Let me be honest: I am imperfect. I am a sinner. I do things that displease my Lord. Each day, I approach the Lord with a list of my most recent sins and I repent for them, seeking God's forgiveness and the capacity to love God and neighbor more faithfully each day. But that doesn't mean that when another Christian leader or layperson create what I think is a misconception of Christian faith, I should keep silent. When people like Pat Robertson (also here) and James Dobson have given the general public wrong ideas about Christ or the Church, I have spoken up. I imagine that Pastor Wright has done this as well. That's not judging; that's witnessing. In some cases, it's leadership. As Pastor Gerald Mann has noted, sometimes it seems that the primary job of Christians is cleaning up the bad reputation given to God by Christians. That's one of the purposes of this series, to analyze some of Jeremiah Wright's public pronouncements from the perspective of Christian faith, and not just as political statements, the way the news media and many bloggers were analyzing them. I'm glad you finally had took the opportunity to view the Rev. Wright through your lens, but do you remember the charactherizaitons you made before you were so kind to actually listen to the mans words. I believe you called his expressions hateful, anti semetic as well as several other things. Earlier this evening, CNN gave heavy coverage to articles by Wright and by a Hamas functionary which appeared last year in Trinity's bulletin. Some of the comments were antisemitic. Others were anti-Israel and some anti-Italian, replete with racial and ethnic slurs. Let me hasten to say that talk like this has no place in Christian discourse. In the most famous passage in the New Testament, Jesus told Nicodemus that God so "love the world," that's everybody. I hope you will now endeavor to correct people when the call the Rev. Wright hateful etc, and I believe you further owe him an apology. Part of what I have tried to do in this series is to fairly understand Jeremiah Wright. I do this in part, in response to Senator Obama's call for building bridges of understanding across the racial divide in this country. But mostly I do it out of simple Christian duty. It is my responsibility as a Christian to attempt to understand my neighbor and to put the most charitable construction on what my neighbor thinks, says, and does. But I have a higher duty to Christ, the Lord Who saved me. I must speak the truth about Christ as a loving Savior Who doesn't like ethnic stereotyping, for example. I also feel I must let you know that no one and especially the Trinity UCC is going to cry one tear if you would not grace that church with your presense. The days of black people having to cow tow and beg for the acceptance of the likes of you is blessedly passed. I don't know what my "likes" are, but I can assure you that nobody has to kowtow to me. I want no one to do so. But I also hope that our churches can be places where all we recovering sinners come to wrestle with the reality of our own sin and be empowered to live with love, confidence, and hope because, through the Savior Jesus Christ, repentant sinners are transformed by God from His enemies to His friends. Based on what I have learned about Trinity United Church of Christ, I'm confident that I would receive a warm and loving welcome if I showed up for worship there. Onto that analysis of some of Jeremiah Wright's more disturbing public communications in the next post, I hope. The newest book by my blogging friend and colleague Dr. Andrew Jackson, Mormonism Explained: What Latter-day Saints Teach and Practice, will be released on April 30. I had the privilege of reading an advance copy of Andy's thorough and readable survey and heartily recommend it. You can pre-order Mormonism Explained over at Amazon.com. O God, your Son makes himself known to all his disciples in the breaking of bread. Open the eyes of our faith, that we may see him in his redeeming work, who lives and reigns with you and the Holy Spirit, one God, now and forever. 1. This week we come to the Third Sunday in Easter. As I've pointed out before, every Sunday is a little Easter on which we celebrate the resurrection of Jesus from the dead. But this season remembers the forty days during which the risen Jesus appeared to believers before ascending to heaven. Ascension Day is followed, ten days later, by Pentecost. 2. Two of our texts for this week were written by Luke the evangelist, the lesson from Acts and the Gospel lesson from Luke. As I pointed out last week, all of the first lessons for the Season of Easter come from Acts, a Biblical book that records the history of the Church from Jesus' ascension until about 60AD. Both the concluding verses of Peter's sermon on first Pentecost, from Acts, and the Psalm emphasize the willingness of God to hear us when we call. In Acts, Peter, no doubt drawing on personal experience, tells a crowd of His fellow Jews the repentant can call on God and be saved from sin and death. The anonymous psalmist of Psalm 116 says that he will worship the God who hears when we call Him in our distress. Both the psalmist and Peter in 1 Peter 1:17-23 address the question of where God is in our suffering. Peter, of course, figures in three of the lessons: as preacher (Acts), author (1 Peter), and corroborating witness of the resurrection (Luke). 4. But the Gospel lesson also suggests that the God we know in Jesus Christ shows up in unbidden ways. There, the risen Jesus simply appears with the two grieving disciples heading for Emmaus. 5. Nonetheless, the lesson also shows us that there are certain reliable places where we can always count on meeting Jesus: in God's Word and in the breaking of the bread (Holy Communion). More on that later. 6. Acts 2:14a, 36-41: This concludes a sermon that will more fully absorb us on Pentecost Sunday. Peter's sermon presents both Law and Gospel: On the one hand, he indicts the crowd for its complicity in Jesus' crucifixion. On the other, he tells them that they can repent and, believing in Jesus, have a right, restored relationship with God. 7. Psalm 116: This psalm has given inspiration for many Christian songs, hymns, and liturgical pieces through the centuries. The psalmist concludes that the goodness of God and God's willingness to hear us when we call is one indication of why and how much we need to worship and praise God. The word worship is the contraction of the Old English term, worth-ship. In worship, we declare the worthiness of God: worthy of our praise, glory, honor, and complete submission. 8. 1 Peter 1:17-23: An old hymn declares, "I am but a stranger here, heaven is my home." Followers of Jesus Christ see themselves as aliens and strangers to this world. Our real home is with God in eternity. That means that we are to travel lightly, not putting too much stock in the stuff of this world. Despite its allurements, Peter says, we dare not be sidetracked. We need to live in awe of and trust in the God made known in Christ. 9. Why? Because, Peter says, we have been bought not with jewelry or gems, but with the blood of Christ, an unblemished Passover lamb sacrificed for all and Whose death and resurrection bring everlasting life to all who repudiate sin and follow Him. 10. What Peter demonstrates is that the life, death, and resurrection was not, after many divine failures, the culminating attempt by God to save humanity from sin and death. As Jesus taught the disciples on the road to Emmaus in our Gospel lesson, from the beginning it was always God's intent to save fallen humanity by means of Jesus' cross and resurrection. Jesus was always God's Plan A for redeeming sinners. All the law and the prophets pointed to this. 11. Luke 24:13-35: In discussing the Gospel lesson here, I'll just touch on a few questions it raises. The first, for me anyway, is why the two disciples--one of them, we learn later, is Cleopas--didn't recognize Jesus? Associated with this is the question, who or what "kept from recognizing" Jesus? Explanations of this abound. I personally don't believe that it was God Who prevented recognition and that what primarily prevented that from happening was their own grief and disbelief. The disciples had seen Jesus die. Some of their number had lain His body in the tomb. Repeatedly, we saw how the disciples placed their hope in Jesus based on what blessings they thought He could bring were He to bounce the Roman occupiers and the selfish local religious and political leaders out of power. In spite of what Jesus had said repeatedly and in spite of all that the prophets had said, Jesus' first followers couldn't recognize Him in the resurrection. 12. How did they recognize Jesus? Interestingly, it didn't happen as He explicated the Word of God for them. It happened in the breaking of the bread, something He did in a characteristic way, as seen in the obvious parallels between Luke 9:16, 22:19, and 24:30 (Thanks, Brian Stoffregen). In one of his books, The Third Peacock: The Problem of God and Evil, Richard Farrar Capon speaks of Holy Communion as "the hat on the invisible man." We can't see the risen Jesus today on earth, but, using Martin Luther's phrase, "in, with, and under" the bread and wine of Holy Communion, Christ has promised that we can "taste and see" the goodness of the Lord. Even when this world and our faint faith prevent us from seeing Christ, we can recognize Him in the Sacrament of Holy Communion. This doesn't mean that the Word is inferior to the Sacrament. Far from it! In fact, the Sacrament is "the Word with skin on it," something we can actually see, the tangible presence of God in our midst. But, as was true of the disciples, we only know the God-Man Jesus when we see Him because of the Word about Him, from Genesis to Revelation. With both the Word explicated by Jesus and the breaking of the bread, the disciples experienced God coming close to them and their hearts burned within them. 13.Why, if it was so dangerous to be out at night in first-century Judea, did the two disciples tear back to Jerusalem after they recognized Jesus? It's simple: Jesus' resurrection had changed everything! The risks that once would have seemed daunting, now seem worth taking. Jesus had confirmed what they never could have believed on their own steam: Jesus had conquered sin and death and was alive for all eternity! They needed to tell the others that the tale brought back from the tomb by the women was true: Jesus had risen and they had seen Him! Besides, when you know the truth of Jesus' resurrection, you're inclined to do goofy things. In John's Gospel, we're told that the aimless disciples, led by Peter, decided to go out fishing one day. 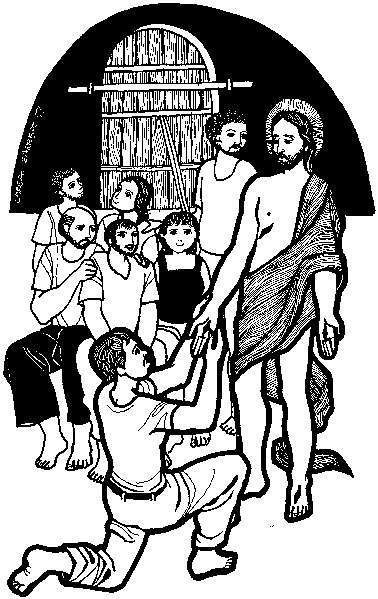 Stripped down to his altogether on what had been a futile venture, when Peter spotted the risen Jesus on the shore, he put on his clothes and jumped into the water. Who adds clothing to take a swim? How many risky or goofy things might we do as Christians if we really believed that Jesus is risen and alive? [UPDATE: One other thing that has struck me as I've continued to consider this passage is how much we don't know. According to John Pilch, for example, visitors to modern Israel will likely be told by tour guides, of six different locations for Emmaus. Fact is, we don't know where it was. The disciple called Cleopas in our text is mentioned in no other place. And we never do get a name for the other disciple Jesus encounters on the road to Emmaus. For now at least, the mainstream media and the blogging world have, for the most part, left the Jeremiah Wright controversy behind. That's too bad in a way and it showcases the problem with what has become not a twenty-four hour news cycle, but a constant assault of headlines, sound bites, video clips, and rapid fire stereotyping often devoid of context or real analysis. Before 1980, when TV network news was established as part of a pantheon of journalistic outlets, joining newspapers and radio, supplanting the latter and in some ways, supplementing the former, there was time to develop stories responsibly, covering multiple aspects. There was even a place for a dispassionate analyst to give nightly commentary, as was true of Eric Sevareid five nights a week on CBS News, his wise words treated almost like wisdom from Mount Sinai. But the Internet of today is a bit like the media landscape of Europe in the 1500s, after Gutenberg's presses had started to make their presence and potential apparent, or of the young united colonies, then United States, immediately before and after the Revolution. In both contexts, pamphleteering, those eras' equivalents of blogs and YouTube videos, became major sources of information and ideas. The Internet is a wild and woolly world. The conventional media, which includes the cable TV networks, feel a need to respond to and carry items making the news on the web in order to keep up. But at times, this causes all of the media players--conventional and otherwise--to express opinions and pass judgments before facts have been established. As I have delved into some of Jeremiah's Wright's thinking, my first impressions have been somewhat changed. I still think that Wright is a polarizing figure and that some of his opinions are indefensible. But, as I think my sharing of the actual content of his post-September 11, 2001 sermon demonstrates, that sermon, in any case, no matter what one thinks of the data he marshalls or the conclusions he draws, is well within the mainstream of Christian thinking, with no hint prejudices of any kind. Even in saying that the 9/11 attacks exemplified our country's chickens coming home to roost, the military veteran who volunteered for several tours of duty in Vietnam, was not disparaging the United States, as he clearly was elsewhere. In his comments on the first installment of this series, my colleague, Pastor Jeff, provides links to several communiques from Jeremiah Wright. They are disturbing and I will take a look at those in the next installment. As will become apparent, I abhor some of the things Wright said there and in other places. So much do I abhor them, in fact, that I cannot imagine being a member of any church pastored by Wright. But I do hope that what I've written and will write about him, about preaching, and about the Biblical tradition of prophetic preaching, will serve as a reminder, at least to anyone who shows up here, that the best thing we can do when an Internet tempest cranks up, it's best to bide our time, bit our tongues, pray, research, and reflect. The Internet gives us access to all sorts of information and ideas. It also gives an unprecedented capacity to put in our own two-cents' worth. But we shouldn't allow the low cost of admission to cheapen our discourse. Even Jeremiah Wright deserves a fair shake. One more. I know it's the NIT. But the performance of the Ohio State men's basketball team in this year's tourney bodes well for next year. In the first installment of this series, I dealt with antisemitic and hateful remarks made or supported by Jeremiah Wright, one-time pastor of Trinity United Church of Christ in Chicago, for twenty years the pastor of Senator Barack Obama. I said that antisemitism particularly, and any prejudicial slur invoked against ethnic or religious groups generally, is not Christian discourse. In short, as revolted as I am by the prejudices and the dangerous silliness Wright has uttered or to which he has given credence, I also wanted to be fair. Growing up, I had extended family members who said silly, stupid, prejudiced things. One relative was absolutely convinced, for example, that Franklin Roosevelt put a pistol to his own head at Warm Springs, rather than dying from a cerebral hemorrhage and palmed off this nutty theory as gospel truth. Some family members canceled reservations at a state park lodge in Ohio after they learned that an NAACP gathering was scheduled the week before their scheduled stay. One member of my extended family was convinced that some medical problems I experienced resulted from my being assaulted by some of my African-American friends, an assault that only happened in his bigoted imagination. Yet, for all their faults, prejudices, and lunacies, I experienced these family members as loving people, in much the same way that Senator Obama experienced Jeremiah Wright. In my own theological tradition--I'm a Lutheran Christian, there is a heavy emphasis on the fact that sin is a condition, an inborn rebellion against God which causes even followers of the God of the Bible to sin. "In sin did my mother conceive me," Israel's greatest king, David, wrote in repenting for murder and adultery (Psalm 51). "Wretched man that I am!" Paul writes in the New Testament, "Who will rescue me from this body of death? Thanks be to God through Jesus Christ our Lord! So then, with my mind I am a slave to the law of God, but with my flesh I am a slave to the law of sin" (Romans 7:24-25) We Christians confess that we are sinners deserving of death, but saints because of what Christ has done for all who are willing to follow Him. As a saint saved by God's grace, I have no bragging rights, no call for gloating or spiritual superiority. Jeremiah Wright's pronouncements are, at times, reprehensible. But they may not always be wrong or signify that he isn't part of the family of God. Indeed, there may be much that's commendable in him and in his ministry. I thank God every day that a preacher doesn't have to be morally perfect or devoid of blind spots to be accounted faithful. Truth to tell, I am deeply mindful of my sins, which is why one of the prayers I utter every single day is, "Thank You, God, for not killing me for my sins as I deserve!" Nor does a preacher have to be an unblinking patriot. A story. Some months ago, I was in a meeting involving other clergy from my own faith tradition. We were talking about the war in Iraq and there were strong feelings around the table. The discussion widened beyond mere consideration of the war itself to the more general subject of patriotism. Anybody who has read this blog very much knows that I am an unabashed patriot. I freely acknowledge the faults of this country and that things like slavery, racial prejudice, and the subjugation of Native Americans are sins, the effects of which continue to pollute our national soul. But I also believe that there is something exceptional in the US character: the first nation to decide itself into being has, by fits, starts, and convulsions, been on a two-plus century-journey toward fulfilling the promise of its founding documents, to be a nation of liberty (as enunciated in the Declaration of Independence) and of mutual responsibility (embodied in the Constitution). America does, in fact suffer, as Martin Luther King, Jr. said, from "a schizophrenic personality." But were it not for these public pronouncements about a very specific national identity, about the vision we are pursuing, that description would be inapt. We can be described as schizophrenic quite simply because we fail to meet the very standards to which we are supposedly committed. In our conversation about patriotism, my colleague said, with an ironic laugh, "I used to be a patriot. I really did." He said it as though patriotism was unworthy of a Christian. Other Christians I know put patriotic fervor for the United States on a par with faith in God. I disagree with both camps. I think that as a Christian, it's possible to love one's country. But the God we meet in Jesus Christ demands that we always put God first. Above personal desires. Above family and friends. Above career. Above country. Above everything. The first commandment tells us, "You shall have no other gods before me." A god is whatever we give highest priority in our lives. If forced to choose between the God I love and the country I love, I hope that God will win every single time. It should really be no contest. And sometimes, my faith in God and my love for my country will compel me to say things that are critical of my country. I feel no hesitation about condemning our materialism and our racism, for example. I am bothered by those whose patriotism is xenophobia, rather than an honest, historically-attuned appreciation for America, flaws and all. For any preacher of the Gospel, be it Jeremiah Wright or Mark Daniels, there are two great strands that must appear in preaching: the pastoral and the prophetic. The pastoral declares the love of Jesus by pointing to His gracious handling of sinners. Jesus, God in the flesh, promises life to all who turn from sin and believe in Him. The prophetic declares the love of Jesus by pointing to the sins that demonstrate our need of forgiveness, both as individuals and as societies. The prophet says, "You have wandered far from God and here are the ways that can be seen." We tend to like preachers when they're speaking pastorally. But those who speak prophetically are, shall we say, less appreciated. In his classic overview of the Old Testament portion of the Bible, Bernhard Anderson, onetime professor at Princeton University, calls his chapter on the Old Testament prophets, "Prophetic Troublers of Israel." Anderson explains that prophets believed that God had sent them to deliver messages to God's people, ancient Israel. The prophets weren't sent by God to make predictions about the future, although that's how some stereotypically see them. Rather, they were sent to tell God's people, "This injustice, that sin, this forgetfulness of God...is not pleasing to God. You are severing your relationship with God and that has its consequences." To put it in more modern terms, the prophets were sent to tell God's people that if they kept rebelling against God, those "chickens would come home to roost." God, they would tell Israel, is patient. He is slow to anger and abounding in steadfast love. But if you keep flouting the will of God--God's will that we love God and neighbor, there will be consequences. Paul talked about this in the New Testament. "Do not be deceived," Paul writes in Galatians 6:7, "God is not mocked, for you reap whatever you sow." The preacher who isn't both pastoral and prophetic, who fails to display both sides of God's love, who fails to call people both to repentance for sin and to confidence in God's grace, and who doesn't preach both Law and Gospel fails to fulfill the preacher's call. Now, with all of that in the background, take a listen to Jeremiah Wright's post-9/11 sermon. I'll come back in a day or two to give my reflections on it. Wright's text is Psalm 137, here. When we lived in rural northwestern Ohio, we never locked the doors of our church or our house. Having been accustomed to always locking up, we fell into this habit slowly. But I remember the moment when I realized that the habit had fully taken hold. We were getting ready to take a vacation and thought it would be a good idea to lock up. I searched high and low though and couldn’t find the house key. What’s more, it dawned on me that it had been months since I’d even seen a house key, let alone used it! Why do we lock our houses, cars, garages? That’s simple enough: We’re afraid. Afraid of intruders harming us. Afraid of having our belongings taken. Locked doors are prudent precautions for us all to take. But, let me ask you this? Are there other doors we lock down tight, doors that maybe we should keep open? He’d been hurt. Two wives had left him for other men. “Never again!” he vowed. “Never again will I let anyone get in.” So he shut down. He woke up, ate his daily meals, did his job. He socialized. But there was always a wall. Somehow though, a thought penetrated his fog of fear and loneliness. “Maybe,” he thought, “I need God.” He met with a local pastor. “What can I do?” he asked. The pastor said there was no magic bullet, but he did have a suggestion. There were no lightning bolts, or, as one of our old hymns puts it, “no sudden rending of the veil of clay.” But when the man came to the pastor’s office six weeks later, something was different. Some of the doors had been unlocked and opened. God stepped in. Later in that man’s progress, friends walked in. Later still, a new wife walked in. They’re still married. Happily. God can do wonderful things when we unlock the doors to our lives, wills, and hearts. The risks and the dangers won’t go away. But what that man would tell you—and yes, he really does exist—is that the payoffs--peace with God and others--are worth the risks and dangers. Today’s Gospel lesson takes us to the Sunday after the first Easter. Huddled behind closed doors, Jesus’ first disciples are a pathetic group. Here they are, recipients of the best news that the world has ever heard—the news that God the Son has died and risen so that all who turn from their sins and believe in Him will live with God forever. It was news that Jesus had spent a considerable period of time preparing them to share this news and His ministry. Yet, they’re not telling anybody about Jesus. They’re not serving anybody in His Name or under His authority. They’re afraid, our translation says, “of the Jews.” But this is a poor rendering. The term in the original Greek of John is Iouadaion and it refers to the people living in and around Jerusalem, Jews like them, many of whom were likely among those who had called for Jesus’ crucifixion just ten days before. This fearful group behind closed doors—the first church—isn’t a lot different from many churches today. Fear keeps them locked behind doors of all kinds. Bill was the part-time pastor of a multi-point parish, meaning that he did worship and provided some leadership in several small congregations. * This was in rural Suwaunee, Georgia. That was pretty much the way things went for the rest of Bill’s time at that church. He writes, “The arguments, the pettiness, the fights in the parking lot after the [council] meeting were more than I could take. It was tough and I was glad to be leaving them behind. ‘You call yourself a church!’ I muttered as my tires kicked gravel up in the parking lot on my last Sunday among them.” Here was a church that, truth be told, had padlocked God and neighbor out of its life. In fact, as the man who’d been left by two different wives came to know, even those of us who have never seen the risen Jesus in bodily form can, through the eyes of faith, see Him. And when we do, it will change our lives! 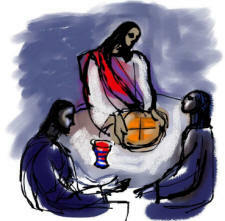 “One day,” Pastor William Self writes, “a man came into my office and asked if I could spend some time with him.” The man showed up and “said he was losing his faith and wanted to leave the church because he was racked with doubts.” Pastor Self told him that he needed to go on a hospital visit and asked this modern day doubting Thomas to go with him. “We drove across town to a large hospital,” Self writes. “We walked through the corridors and found the room of the patient whom I was [visiting]…The patient was a young doctor in his late 30s who was dying…As we entered the room, we noticed all the medical equipment hooked up to his body, but he was very conscious of our presence and wanted to talk. We talked for a moment about life and death. I read Scripture, and we prayed together. My doubting friend was there with me and stood at the foot of the bed as I stood at the patient's side. The entire process in the room took about 15-20 minutes. There were tears in the eyes of the patient in the bed as we turned to leave. We went down the hall to the elevator and then out to the parking deck before either one of us said another word. Finally, on the way back to the church my doubting Thomas turned and said, ‘I see things entirely differently now. Eternity has broken into my life, and I want to start all over with Christ.’"
When we dare to unlock the doors of our lives, the risen Jesus can come in, and change us from fearful people worried about today and tomorrow--maybe yesterday--into confident believers who, like Thomas and the members of the early Church, go into the world with the love of Christ and the message of salvation in His Name. That’s what happened in that once-padlocked church in Suwaunee, Georgia. A few years after Bill left the church, he met the twenty three year old pastor who was, by that time, serving there. Bill felt sorry for him. But the young pastor began talking about what a remarkable church it was. It was supporting about a dozen poor families in its county, ran a free day care center, and was a place where interracial families, snubbed elsewhere, found a welcoming home. What happened? “I tell you what I think happened,” writes Bill, now a bishop in the United Methodist Church. “I think that…someone greater than I knocked the lock off that door, kicked it open and offered them peace, the Holy Spirit, mission and forgiveness. And now” they can rightly be called a church. Folks: I believe that the risen Jesus has plans for Saint Matthew Lutheran Church. In you, I see a people willing to open your lives to Jesus, to confess Him as your Lord and God not just with your mouths, but with your lives. In a few weeks, on the Friday evening and Saturday morning before Pentecost, I want to invite you to participate in a prayer vigil here in Saint Matthew’s sanctuary. From 6:00 on Friday night until 7:00 on Saturday morning, I’ll ask individuals or families to be here for half-hour stints. Your goal? To pray for this wonderful congregation and our ministry to the community and the world. To pray that the Risen Lord, Who breathed onto that frightened band of disciples in a locked room in Jerusalem, will breathe on us, giving us renewed faith and boldness in sharing His love and inviting others to follow Christ with us here in Logan and Hocking County. To pray that we will unlock the doors of our lives and let Jesus Christ into every part of our lives. I plan on being here to pray that night, too. I’ll be around for. And there will be materials here to help you pray. We’ll have sign-up sheets in the fellowship hall next Sunday. I hope that every half-hour block will be filled with the names of at least two people who will pray. If you can’t drive at night, I ask you to indicate when you’ll pray for Saint Matthew at home during the vigil. The risen Jesus came to the frightened disciples, gave them His peace, and that band of people then turned the world upside down in the Name of Jesus Christ. Jesus is still risen and still in business. He still has things He wants to do through you and me and through Saint Matthew. When we dare to unlock our wills, minds, and hearts to the risen Jesus, He will enter in. He will give us His peace and He will use us to do wonderful things in His Name! *"Bill" is William Willimon, a fantastic preacher and able theologian, who told this story about his days as a student pastor here.